UGC NET Answer Key 18 Dec 2018 – Get here Final Official UGC NET Answer Key for the exam held on 18 Dec 2018. National Testing Agency (NTA) releases official UGC NET Answer Key 2018. The answer key has been released at the official website i.e. ntanet.nic.in. For Paper 1 and Paper 2 official answer key has been released. NTA will calculate marks on basis of final official answer key for the purpose of announcing result of UGC NET 2018. From this page, candidates will get full information regarding UGC NET Answer Key 18 Dec 2018. Latest: The Final UGC NET Answer Key 2018 has been released, check the same from below. Answer Key helps applicants in predicting their marks in the examination. This year exam mode is online so with the cooperation of candidates appearing for the exam we have provided you the memory based answer key. Click Here to check the Final UGC NET Answer Key 2018. NTA has released UGC NET 18 December 2018 answer key, question paper and responses on December 25, 2018. Candidates can check and submit objections until December 28, 2018. Have a look at UGC NET 2018 exam analysis to know what experts felt about the paper. At the official website i.e. on ntanet.nic.in, NTA will release the UGC NET Answer Key 2018 For 18 Dec 2018. After three to five days from the exam date, answer key will be released. Officially released answer key will be considered for checking the examination paper. Applicants can follow the steps given below for checking the Official UGC NET Question Paper with Answer. 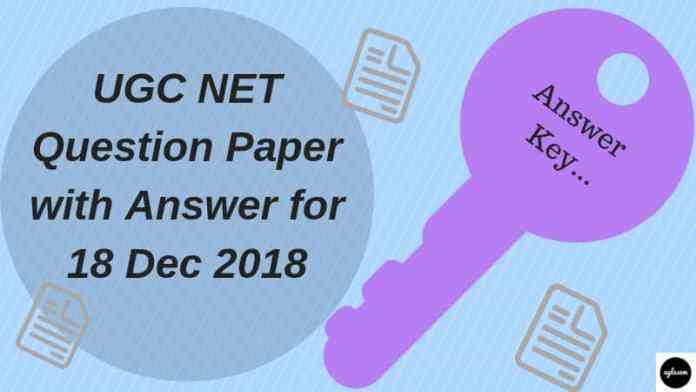 How To Check Official UGC NET Question Paper with Answer For 18 Dec 2018? After viewing the UGC NET Answer Key 2018 candidates should take the print out of it for future reference. Candidate can follow the given below steps for checking the UGC NET Answer Key 2018. Thereafter, answer key page will display on the screen. How To Calculate Marks Form UGC NET Question Paper with Answer For 18 Dec 2018? From the UGC NET Answer Key 2018, the candidates can check their answers that whether the question which he/she has answered in the UGC NET Exam is correct or not and by following this procedure candidate can get the idea of their scores in the exam. But while calculating the marks please follow the marking criteria and see the exam pattern then only the candidate can estimate the correct scores. For an incorrect answer, 0 marks will be deducted which means that there will be no negative marking. Note: If any question is found wrong then the marks for it will be awarded to only those who attempted that question. From the exam, pattern candidate got to know about the examination duration, number of questions, paper detail etc. For estimating the correct scores candidates should know about the exam pattern. From below candidate can see the Exam Pattern for UGC NET 2018. After the successful conduction, the examination result will be declared by the NTA. The result is scheduled to be declared on January 10, 2019. On the official website, the result will be declared. The result will be based on the performance of the candidates in the examination. For checking the result candidates have to mention the asked login credentials at the login page. The result will contain the name and roll number of the qualified candidates.